A Faresin telehandler at the Brisvegas Machinery office. Brisvegas Machinery has been appointed as the dealer for Faresin telehandlers and feed mixer wagons in North Brisbane, the Sunshine Coast and North Queensland. Brisvegas Machinery’s Faresin representative, Tim Parker, says the addition of the brand to its product range will broaden its footprint in Queensland and meet the needs of the state’s agriculture, construction, mining and logistics markets. "Queensland has a very versatile landscape with everything from mining and construction sites to large farming properties," Parker says. "The addition of Faresin telehandlers and feed mixer wagons will definitely get some conversations started with customers we previously haven’t had contact with before from our construction machinery range. 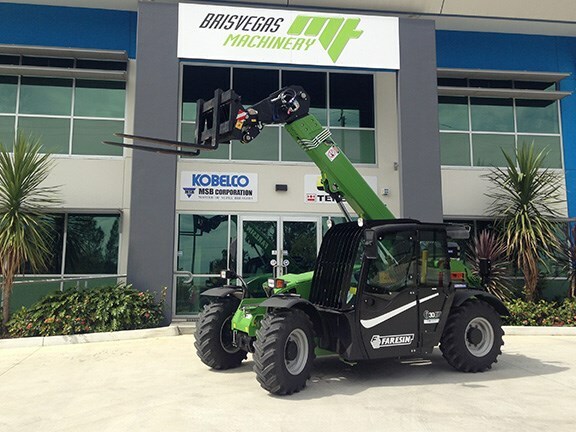 "The decision only strengthens Brisvegas Machinery’s position to be able to offer products to suit all our customer’s needs and requirements on the job." On the telehandler side, Brisvegas will supply machines that reach from 6m to 17m with stabilisers for maximum lifting height. The lift capacity of the new range varies from 2500kg to 7000kg. Parker says Faresin provides one of the largest ranges of trailed and self-propelled mixer wagons on the market, and Brisvegas Machinery will supply trailed models from 2.5 to 46 cubic metres and self-propelled from 11 to 33 cubic metres in size.